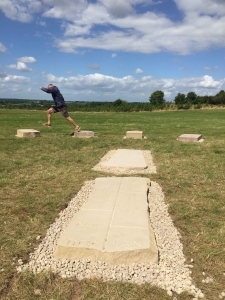 The enormous human sundial that I have been working for some time has finally been installed in its location in a field on a Woodland Trust owned site in North West Leicestershire. 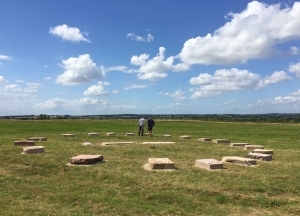 The stone circle consists of 20 carved sandstone elements depicting, not only an hour, but also a plant/flower belonging to a country and also the distance to that country from where you are standing. The stone sundial requires a person to stand on the central stones on a sunny day. The direction of their shadow accurately tells the time, give or take some seasonal differences. The outside stones weigh approximately 300kgs each and are roughly 800 x 600 x 300mm. 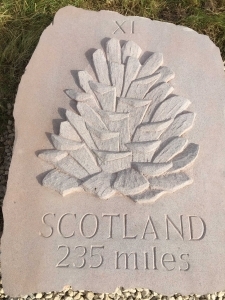 They are carved in variety of sandstones including Peak Moor, Cove and St. Bees. The piece should provide an educational element to the woodland trail and interesting focal point for many years to come.